Need Space For Your Next Get Together? 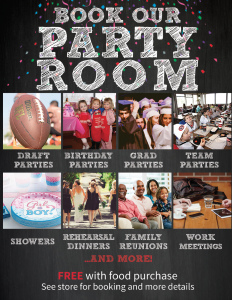 All of our Davanni’s shops (except Uptown) have Party Rooms! Each shop is a bit different in size and capacity, but definitely tailored to suit your party needs! We’ve hosted Birthday Parties, Work Meetings, Community Meetings and Gatherings, Rehearsal Dinners, Wedding Receptions, Grooms Dinners, Baby Showers, Wedding Showers, Graduations Parties, and more! The majority of our Party Rooms have an LCD TV with hookups for your computer, if needed, and all of our shops have Free Wi-Fi. The food options are endless with all of your Davanni’s menu favorites like our classic Pizzas, Hot Hoagies, Calzones, Pasta, Lasagna, Salads, and more! All shops (except Riverside) have Craft Beer and some with Wine too! Every shop has a Coca-Cola Freestyle machine with 100+ options for you to choose from – including all your regular Coke favorites and low/no-calorie options including sparkling water options too. We also now have Honest Tea Unsweetened and Just a Tad Sweet Raspberry Tea. Fantasy Football draft parties are just around the corner so be sure to reserve your party room early! Just call any of our 21 Davanni’s Party Room Locations. You can call ahead or order online your food order so we can have it ready at the time your group arrives. There is no room booking fee! We do require a $7/person food purchase to book our party rooms and there may be a minimum number of people per room requirement. Party Rooms are subject to shop availability. Ask your shop for more details!